Of all my favorite foods to eat out, Thai food is definitely my favorite! I love the bold flavors, creamy curries, and fresh garnishes. Sometimes making Thai food at home doesn’t compare to what you get in a good restaurant. I think it’s because ingredients like fresh kaffir lime leaves and Thai basil aren’t things I usually (ever) have sitting around my kitchen. 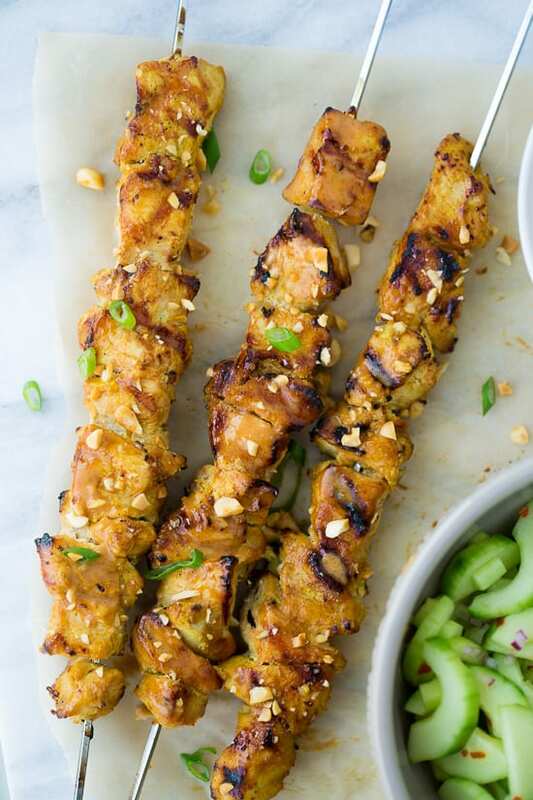 However, these Thai peanut chicken skewers will rival the flavors of any restaurant dish and are made with easy-to-find ingredients. 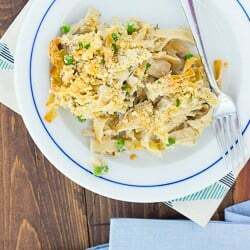 The chicken is marinated in a flavorful coconut milk mixture. 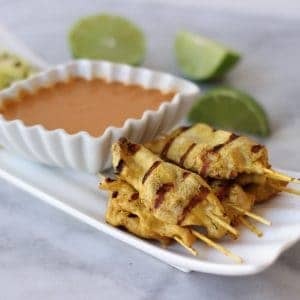 It’s then grilled and topped with the most delicious peanut sauce. Thai peanut sauce has my heart forever. I like serving this with extra sauce, white rice, crushed peanuts, and a quick pickled cucumber salad. 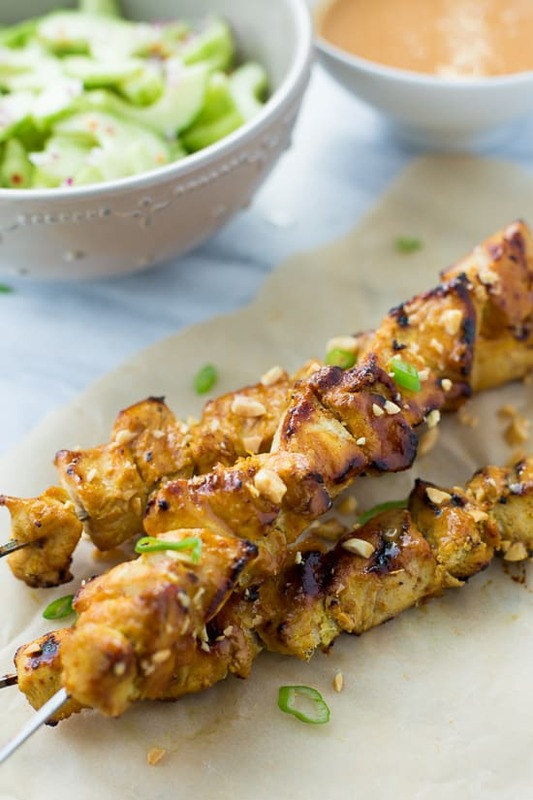 I’ve adapted this recipe from this chicken satay recipe that I posted waaayy back. 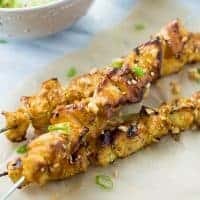 I loved the idea of taking chicken satay and making it a whole meal. My boys are always fans of anything bite-sized you can eat off a stick. It’s a real crowd-pleaser for both adults and kids alike for summer barbecues! I like serving this with a chopped peanuts, a quick pickled cucumber salad (see note) and white rice. Tamari is simply gluten-free soy sauce. I use the brand Thai Kitchen for the curry paste, which is gluten-free. For the chicken: Whisk all the ingredients for the marinade together. Place the chicken chunks in a bag or swallow dish and pour the marinade over. Stir to combine and refrigerate for at least 2 hours and up to overnight. For the peanut sauce: Heat the coconut oil in small saucepan over medium. Add the curry paste, sugar, and garlic; cook, stirring constantly, until fragrant, about 1 minute. Pour in the coconut milk and bring to a simmer. Whisk in the peanut butter until the mixture is smooth. 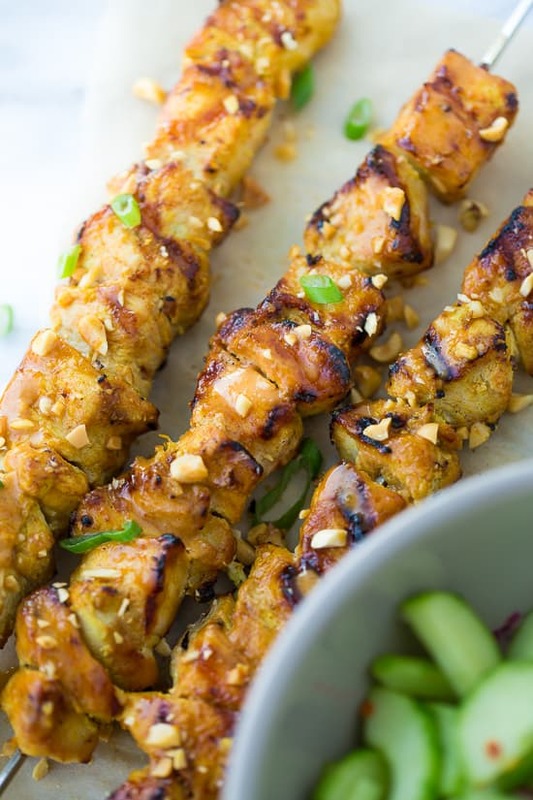 Remove from heat and stir in peanuts, lime juice, fish sauce, and soy sauce. Cool to room temperature. When you’re ready to cook the chicken, thread the chicken tightly onto metal (or soaked wooden) skewers. Preheat a grill or grill pan over medium-high heat. Oil the grill generously. Grill the chicken for 5 minutes per side until cooked through, about 15 minutes total. 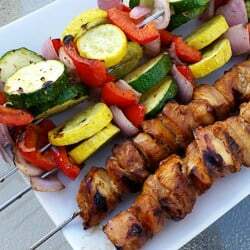 Remove the chicken from the grill and remove from the skewers into a bowl. Pour about half the sauce on the chicken and toss to coat. Alternatively you can brush the sauce on the chicken skewers, but I like it best in a bowl with extra sauce. Top with chopped peanuts and scallions if desired. Serve with the extra sauce. Enjoy!